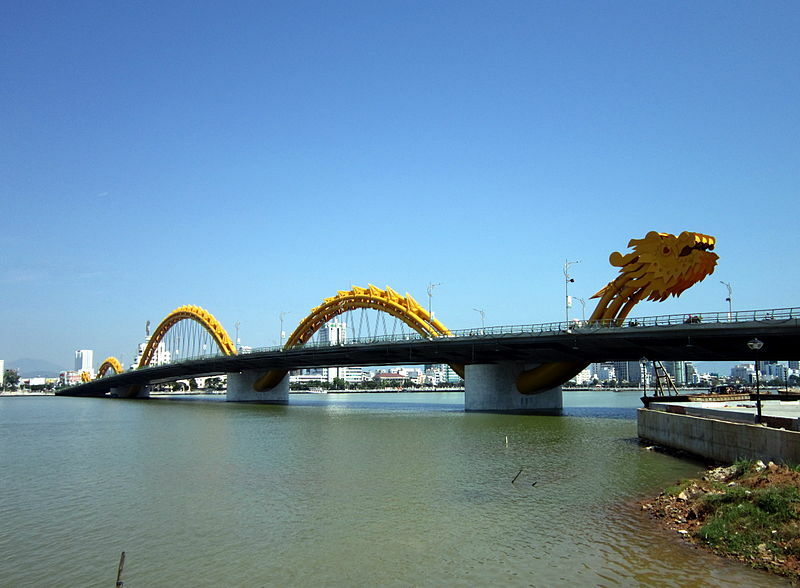 Dragon Bridge, Da Nang, Vietnam, 666m long, opened March 29, 2013 designed and built in the shape of a dragon and to breathe fire and water each Saturday and Sunday at 9 PM so spreading the benefits from the elements in eastern direction towards the sea, The feng-shui idea behind that could also include the aim to protect the city and region of uncontrolled inflow of energies from the direction of the sea. 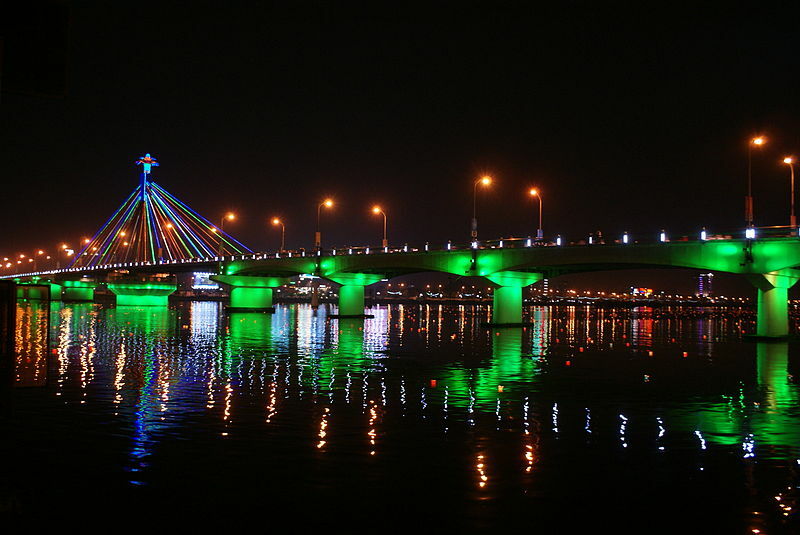 Astrogeographic position for morphogenetic field level 3 which describes how the bridge is embedded in the city of Da Nang: the full spann of the bridge leads form self-protective earth sign Virgo (west – left side) sign of reason, health, protection, healing, adjustment into air sign Libra (east bank – right end) sign of bridges, gates, openness, symmetry, decoration, peace, harmony and relationship. Libra is a major indicator for chiese culture and as such for symbolic meaning of the dragon as a bringer of luck. The 2nd coordinate is located in solid, conservative, strict, defensive earth sign Capricorn sign of stability, control, authority, government institutions, impediments, rules, duty.and exorcism. The coordinate in Capricorn is valid for the latitude coordinate and as such for the full spann of the bridge. 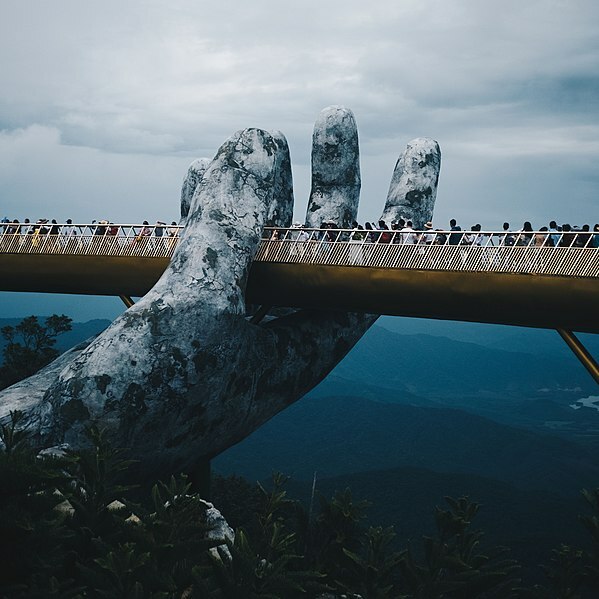 Opened in June 2018 Cầu Vàng (golden) bridge is located at 1380 m altitude in the Bà Nà Hills to theeast of the seaside tourist town of Da Nang Vietnam. The superlarge hands are made from steel with fibreglass. The green colour (or moss) growing on the hands points at their symbolic meaning as a symbol of mother natures hands holding the visitors and humanity as a whole..
Astrogeographic position for morphogenetic field level 3 which describes how the constructions site of the bridge is embedded in the landscape: one coordinate is in highly attractive, mnagnetic, self-centered, royal fire sign Leo sign of the sun, light and of golden colour resonating with the sign´s inner pressure to want to shine and impress. Leo relates to the extreme attractivity of the Da Nang area for the fast growing tourism and people´s never ending hunger and lust for new experiences and sensations that attract millions of visitors each year. The 2nd coordinate is located in careful, self-protective earth sign Virgo sign of reason, health, ecology, fear, spirits of plants & nature, dwarfs, elves, trolls, moss, protection of nature and iresonating aspect here for the effect of the superlarge hands to remind people of the fact that their lives depend on mother nature. Astrogeographic position for morphogenetic field level 3 which describes how the bridge is embedded in the city of Da Nang: the full span of the bridge leads form self-protective earth sign Virgo (west) sign of reason, health, protection, healing, adjustment into air sign Libra (east bank) sign of bridges, gates, openness, symmetry, decoration, peace, harmony and relationship. The second coordinate is located right in the center of dynamic fire sign Sagittarius sign of style, design, fashion, arrow and bow and the resonating astrological factor for all round forms, circles, cycles and as such for the round building in the center of the bridge. The position in Sagittarius is a breathtaking analogy to the capcity as a swinging bridge.